Most of the SVU staff is relaxing during the evening. Fin and Rollins are at a concert, while Benson reads a story to Noah and fends off questions about Sheila. Meanwhile, a nanny named Lourdes says goodbye to her charges and goes clubbing with friends. She sees a guy, Miguel who looks familiar to her. She approaches him and he claims not to remember her. They go to his apartment and make out, but Lourdes pulls a gun on him. She says she hopes he remembers her now. Carisi is on the night shift and about to go home. The last perp of the night is an arrestee who sexually assaulted people on the subway. After dealing with him, Carisi is about to take off when a guy shows him a phone he found in the club. There is a live stream of Lourdes tormenting Miguel, who is tied to a chair, Lourdes keeps threatening him with her gun and claiming he raped and tortured her. He insists he doesn't know her and she has the wrong guy. Another guy walks in and she hits him over the head twice. SVU watches the live stream and looks for clues. They realize the apartment is on Central Park West. A cop tells everyone "no heroes, always have backup" (which obviously means the opposite will happen). Most of the team strikes out. Lourdes finds the camera and rips it out of the wall. Benson hears voices and walks into an apartment where Lourdes is holding a cop at gunpoint. Lourdes cuffs Benson with her own cuffs. She says she wants her as a witness. She says Miguel raped her. 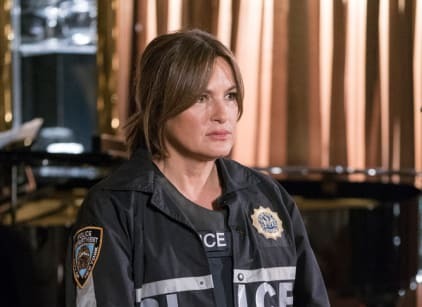 Benson identifies with her because of her own ordeal with William Lewis. She says she believes Lourdes. Lourdes tells her she was raped over and over by a member of the Mexican cartel while crossing the border and then sold into domestic slavery. Benson tells her this is not the way to get justice. Fin calls. Benson says she has to answer the phone. Lourdes answers it for her. Benson subtly alerts Fin something is wrong by saying to tell Rollins to pick Jenny up from school. Then she convinces Lourdes to untie Miguel. She says she's going to arrest him. Lourdes takes them out to the terrace and tells Miguel to get on the ledge. She says jump or she'll shoot him. Benson talks her down. She gets the gun from her just as help arrives. Benson tells Fin she's fine. She tells the cops to arrest both Lourdes and Miguel. They are both led out in handcuffs.